I only got a shot of her basket on my iPhone, but I love how it turned out! The basket is from Target and I just lined it with patterned tissue paper from Hallmark. I couldn't find a stuffed bunny I really liked, so we ended up with this cute little sock monkey! My mom is a massive lover of sock monkeys so of course we have a lot of them around ;) I found this one at TJ Maxx. Another little toy we got her was this adorable wrist rattle set. They can be used for ankles, too. She hasn't shown much interest in them yet, but I think that may be because they don't make too much noise. Another complaint I have is that they aren't very big -- as in, they only fit well on bare ankles and wrists, and Lucy is not very chunky. Maybe she'll like them a little more later. I want to try and get Lucy a new book for every occasion. I want to build up her library and her love of reading at a young age. This is the first book we have purchased as a gift for her, and I like that we went with a classic. Everyone has to have Goodnight Moon on their bookshelf! We chose the board book version. Along with toys and a book, we decided to throw in something she needed -- a paci clip! She is constantly knocking her paci out of her mouth or dropping it while trying to talk. This saves me picking it up off the ground or searching for it all over the place in the middle of the night (or on car rides! It always seems to end up at the bottom of the seat!). Okay, so technically Nana got these, but we gave them to her in her basket. She won't know the difference. I'm in love with all the cute flamingo stuff available for summer this year! The sunglasses, bathing suit, and sun hat are all from Target. I also got her this beach towel from Carter's a while back that will go great with this outfit! 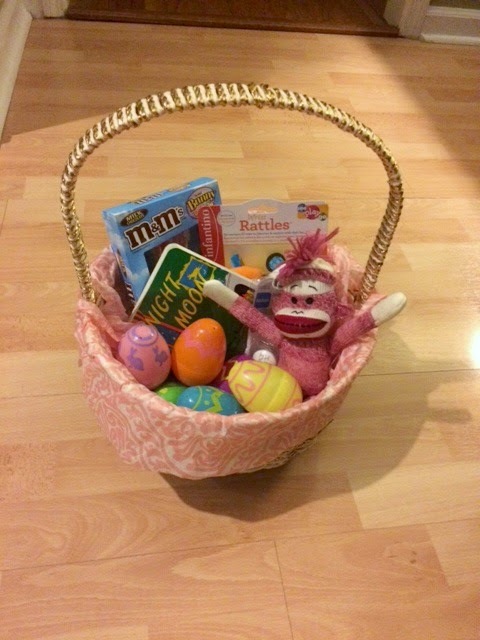 Okay, so I couldn't just give her an Easter basket with no candy, could I? ;) Suffice it to say, the candy was for Mommy. 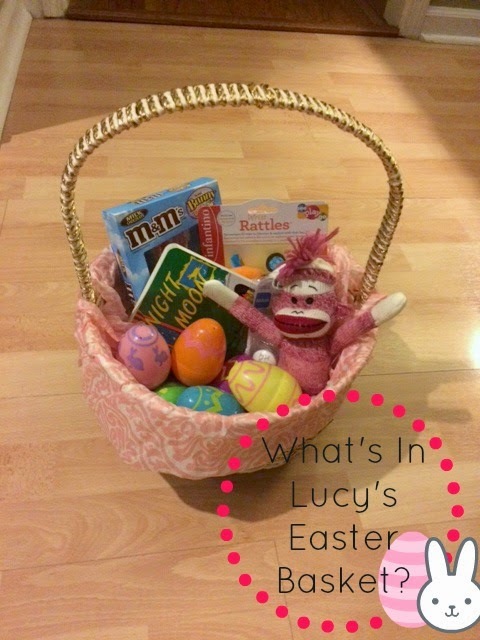 We filled the eggs with Cadbury Mini Eggs -- my favorite! Somebunny had a happy first Easter! Sleeper is from Gymboree (No longer available). 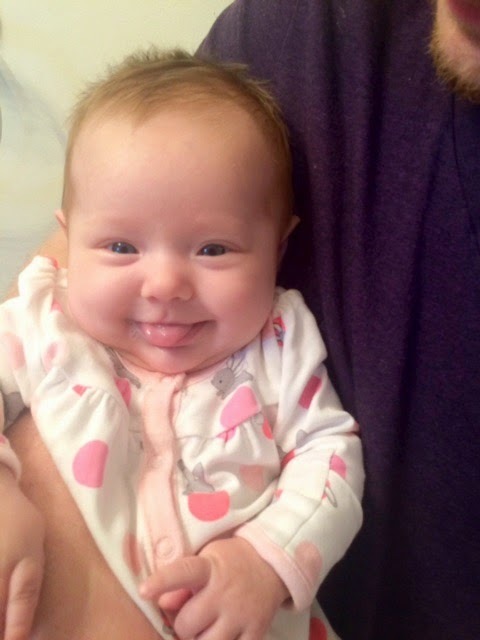 She also found her tongue and can't stop sticking it out!